Multiferroic compounds are materials that exhibit two or more switchable states, such as polarization, magnetization or strain which are again interdependent from each other. Magneto-electric multiferroics have recently attracted a lot of interest due to the exceptional properties which allow the control of spontaneous ferroelectric polarization by applied magnetic fields, ultimately leading to new types of magneto-electric devices. Unlike in conventional ferroelectrics, in the manganite perovskites, such as TbMnO3 and DyMnO3, ferroelectricity arises from a peculiar coupling of the lattice to a spiral ordering of Mn-spins. A strong anisotropic dependence of the spontaneous electric polarization on the direction of the magnetic field is found which can be related to the spiral ordering of the magnetic moments. 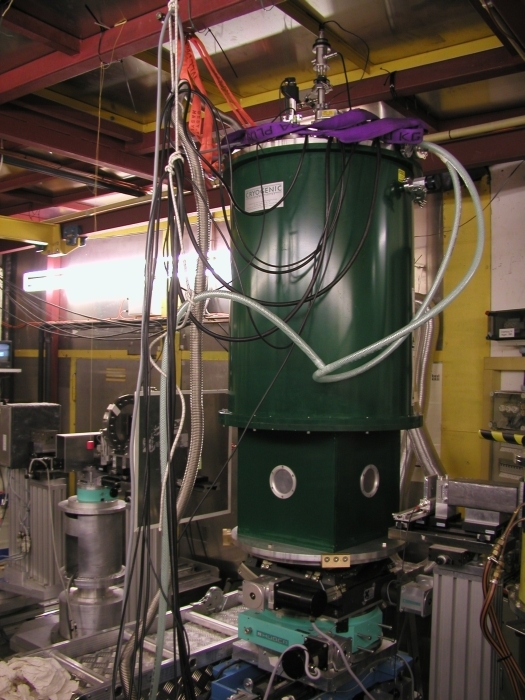 The work presented here is a joint effort both from neutron diffraction studies at HMI and x-ray diffraction at HASYLAB, where the two methods very nicely complement each other. Fig. 1: Crystal and magnetic structure of TbMnO3 in the ab-plane. (a) A model of the IC magnetic structure below TN. (b) A model of the Mn spin structure for H>HC. The large arrows on ferroelectrically active octahedra indicate the direction of polarization predicted from these displacements. At zero field, TbMnO3 undergoes a magnetic phase transition into an antiferromagnetic (AF) phase with sinusoidal modulation of the magnetic moments at the Néel temperature TN=41K. In the AF-phase, the Mn moments are aligned along the b-axis. The propagation vector is (0 m 0) with m = 0.29 rlu at TN. This means the magnetic wave vector is incommensurate to the structural unit cell of the compound. The incommensurability m decreases with decreasing temperature and stabilizes at the critical temperature TC = 28 K at a value of m = 0.28 rlu. At TC, spontaneous ferroelectric polarization along the c-axis (P||c) arises . As found by neutron diffraction studies, the magnetic order changes at this temperature from sinusoidal to helicoidal with no change in wave vector. In Fig. 1a, the magnetic structure below TN is depicted in the ab-plane. Fig. 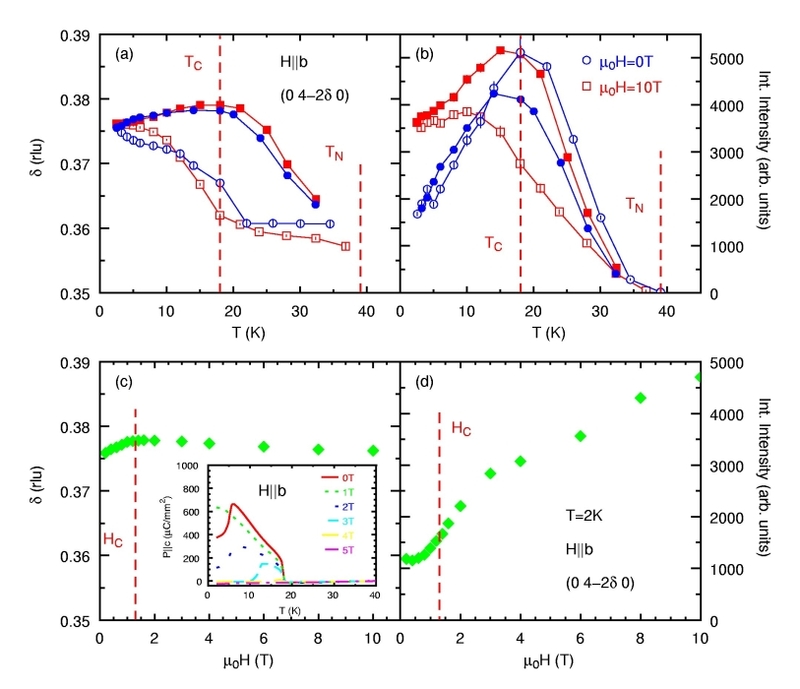 2: (a) Intensity and (b) wave vector (0 k 4) of the structural first and second harmonic reflections of TbMnO3 as function of magnetic field H||b, measured at a sample temperature of 10 K.
In addition to the magnetic first harmonic superlattice reflection a second harmonic reflection with l = 2 m is present, which is of purely structural nature. This can be investigated by non-resonant x-ray scattering due to its high sensitivity to structural distortions. If magnetic field is applied along the a- or b-axis, at fields of ~ 1 T, first harmonic structural superlattice reflections start to appear on top of the magnetic superlattice reflections as found by both, neutron diffraction and resonant x-ray scattering experiments. These structural first harmonic reflections show a linear increase of intensity with the applied field (Fig. 2a). As an explanation, we here suggest that as field destroys the spin spiral ordering, a linear magneto-electric effect arises. Indeed, a linear behaviour in the relation between the spontaneous polarization P and the applied magnetic field H is evident from polarization data, which is also reflected in the linear increase of the superlattice reflection intensities. At the critical field, the polarization flops from P||c to P||a with increasing magnetic field and a shift of the wave vector from the incommensurate (IC) to a commensurate (CM) position is observed for both first and second harmonic reflections ( m = 0.25 rlu. and 2 m = 0.5 rlu), as is shown in Fig 2b. This IC to CM transition implies a simplification of the magnetic spiral order present below HC by a magnetic moment arrangement which agrees with the CM reflections. Here we propose a simple ↑↑↓↓-arrangement of the magnetic moments along the b-axis with a magnetic unit cell four times the size of the structural unit cell in this direction. 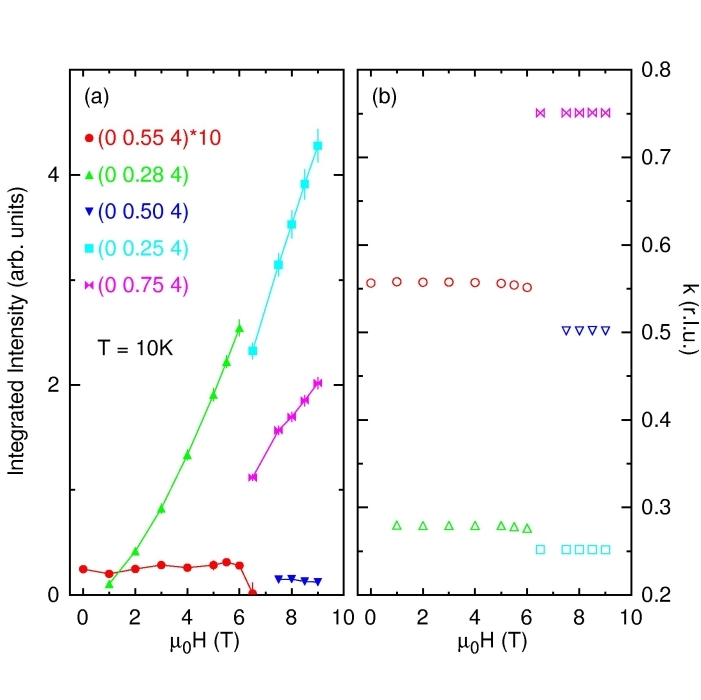 An exchange striction mechanism from competing ferromagnetic and antiferromagnetic super-exchange interactions in this scenario predicts a P||a phase for CM ordering with m = 1/4 rlu, valid in the absence of a spiral magnetic ordering and consistent with our data (Fig 1b). Fig. 3: (a) Incommensurability and (b) intensity of the DyMnO3 second harmonic superlattice reflection (0 4-2 0) as function of temperature for zero field and 10 T. Magnetic field dependence of (c) wave vector and (d) intensity at T = 2 K. The inset shows the spontaneous polarization P||a as a function of magnetic field H||b. DyMnO3 shows a very similar behaviour to TbMnO3 of electric polarization in the temperature-field phase diagram. The Néel temperature and the onset of spontaneous polarization are TN = 39K and TC = 19K, respectively. The critical fields for H||a and H||b occur already at a lower fields in the H-T-phase diagram. 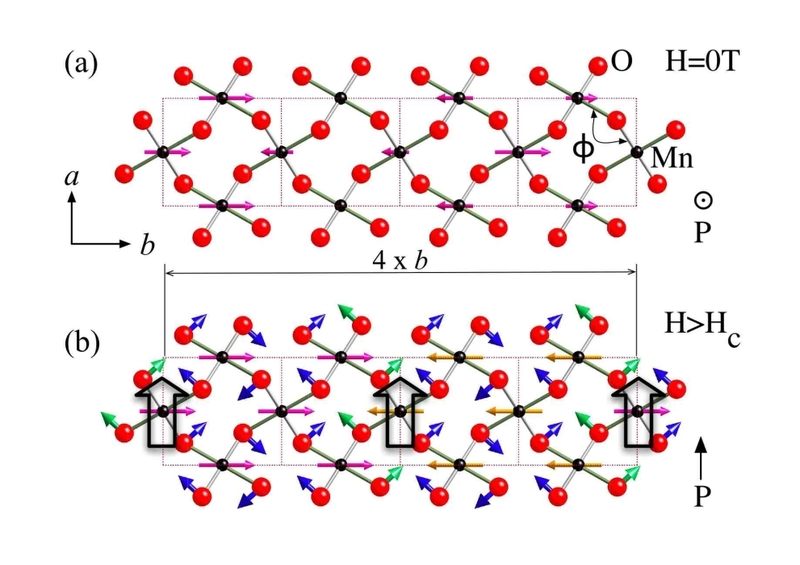 The compound shows incommensurate magnetic and corresponding structural reflections but with different values of m, as compared to TbMnO3. 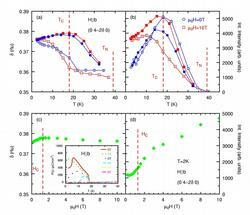 The incommensurability in DyMnO3 is m = 0.38 rlu at TC compared to the m = 0.28 rlu for TbMnO3. With all this similarities between the two compounds, it is striking that no incommensurate to commensurate transition of the wave-vector is observed in DyMnO3 at the critical field where the polarization flop P||c to P||a occurs. Instead the wave-vector varies continuously through the flop transition (Fig. 3c-d). Also the hysteresis effects present in both, the wave vector and intensity, are very similar for measurements performed without field and in an applied field of 10T (Fig. 3a-b). In the general case, the polarization flop is driven by a flop of the axis of rotation of the magnetic spiral as was pointed out by Mostovoy et al . 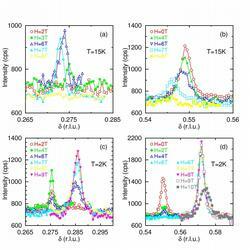 The direction of the spontaneous ferroelectric polarization is determined by magnetic anisotropy terms. From the perspective of symmetry, there is no restriction that the high field spiral must be CM. In this view, the magneto-elastic phase transition to a CM phase in TbMnO3 would be a special case, especially when we did not find such a transition in DyMnO3. The difference in behaviour between the two multiferroics is not of fundamental nature but rather lies in the magnitude of the incommensurability. For TbMnO3, m = 0.28 rlu lies close to the CM value of 1/4. For this value of the wave vector, the amplitude of the magnetic moment is not modulated as described above, and may thus be energetically more favourable than an IC amplitude modulated phase. For DyMnO3, m = 0.38 rlu. is further away from a CM value (1/3) and thus such a transition to a CM phase is not as favourable. This smooth behaviour of the spiral wave vector in DyMnO3 at the spin flop transition may explain the large increase of the dielectric constant εa, observed in this compound [4,5]. At the critical field, where the spin-flop transition occurs, there is a freedom to rotate the spiral around the b-axis. The corresponding magnetic excitation can be excited by an electric field E||a. Its softening at HC would result in a divergence of the static dielectric susceptibility εa, as is observed in DyMnO3. Fig. 4: First and second harmonic reflections as function of the applied magnetic field H||c for T = 12 K (a-b) and T = 2 K (c-d). If magnetic field is applied along the c-direction (H||c) the system enters, other than for H||a and H||b, into a paraelectric phase at the critical field with a minimum critical field of 7T at around 12 K. This high field phase is characterized by a simple commensurate antiferromagnetic order of the Mn-spins. 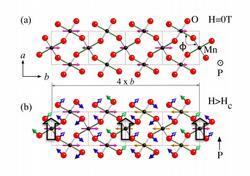 At lower temperatures, ferroelectricity remains up to high fields. 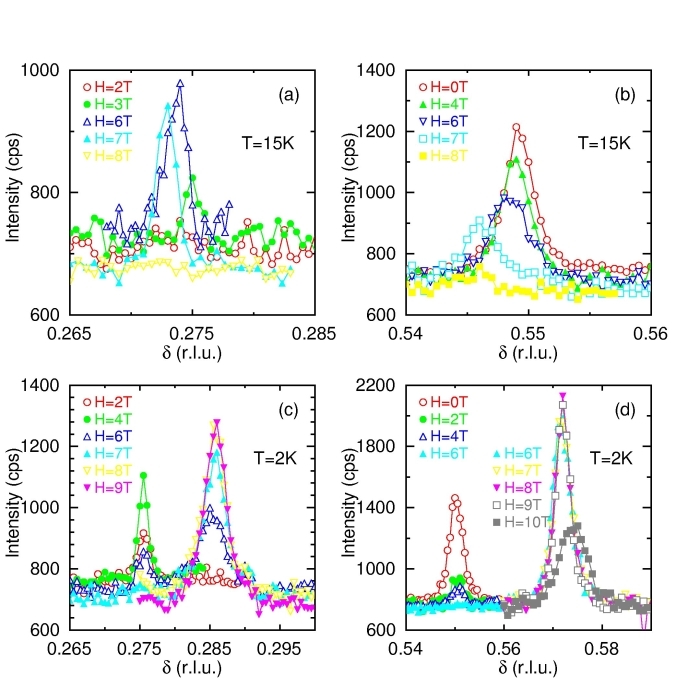 As temperature is lowered with the system in the paraelectric phase at high fields, re-entrance into the ferroelectric phase is observed that coincides with the development of incommensurate Mn- and Tb-spin ordering. This is illustrated in Fig. 4, where the 12K data show the transition into the paraelectric phase with the vanishing of the superlattice reflections at 7T (Fig. 4a-b) and the 2K data show the incommensurate reflections up to fields of 10T, which is still below the critical field at this temperature (Fig. 4c-d). At 6T, a discontinuous jump of is observed for both m and 2 m. This jump that is also observed for mTb at a different field, is due to sharp magnetoelastic transitions in both, the Mn- and Tb-sublattices, which correlate well physical properties measurements . In summary, we find a linear increase of the first harmonic incommensurate and commensurate reflections in TbMnO3 as well as in DyMnO3 and an incommensurate to commensurate transition of the wave vector of the superlattice reflections in TbMnO3 for field H||a and H||b. By looking at the results from DyMnO3, where the incommensurate to commensurate transition is absent, this transition turns out to be a special case due to an energetically favourable spin configuration in the high field phase and is thus not essential for the polarization flop to occur. On the other hand, the appearance and linear increase of the first order structural reflection is a general feature of the two multiferroic compounds. 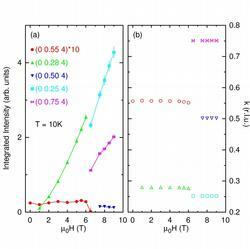 Application of the magnetic field along the c-axis melts the incommensurate magnetic ordering of the Mn spins, which coincides with the suppression of ferroelectricity at the critical field. M. Mostovoy, Phys. Rev. Letters 96, 067601 (2006). T. Kimura, T. Goto, H. Shintani, K. Ishizaka, T. Arima, and Y. Tokura, Nature (London) 426, 55 (2003). T. Kimura, S. Ishihara, H. Shintani, T. Arima, K. T. Takahashi, K. Ishizaka, and Y. Tokura, Phys. Rev. B 68, 060403(R) (2003). T. Kimura, G. Lawes, T. Goto, Y. Tokura, and A.P. Ramirez, Phys. Rev. B 71, 224425 (2005). T. Goto, T. Kimura, G. Lawes, A.P. Ramirez, and Y. Tokura, Phys. Rev. Letters 92, 257201 (2004).